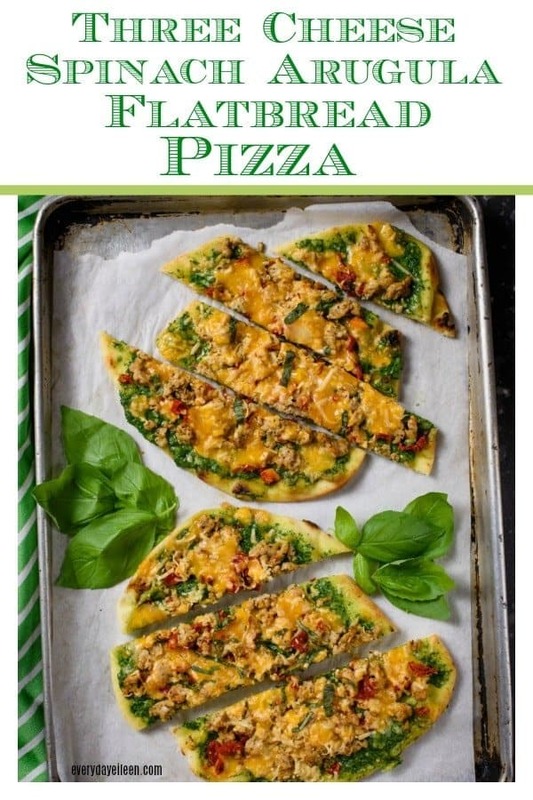 What is great about this flatbread besides tasting amazing is how easy it is to put this together and enjoy! This post is sponsored by the North East Dairy Association, however, all opinions are my own! I don’t know anyone who doesn’t love pizza! Flatbread pizzas are becoming my new favorite because they are so easy to put together. 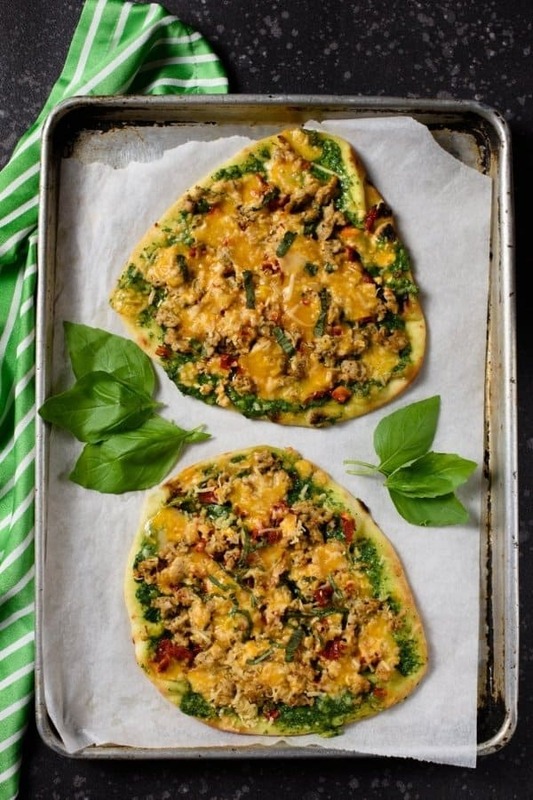 Even the kids can put together their favorite toppings onto a flatbread. Then, in just a few minutes in the oven, you have lunch or dinner! Last month I got to spend a few days with the wonderful people at the North East Dairy Association and some amazing food bloggers! 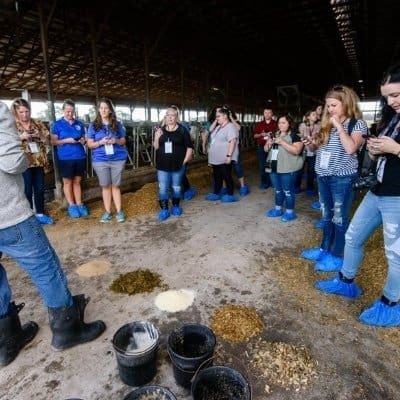 The focus was on food bloggers learning about how the day in the life of a dairy farmer! What an eye-opening trip for me! I have such a new found respect for dairy farmers! Their love of their animals and land is as much as their love for their families! I also found that their families shared that same love. 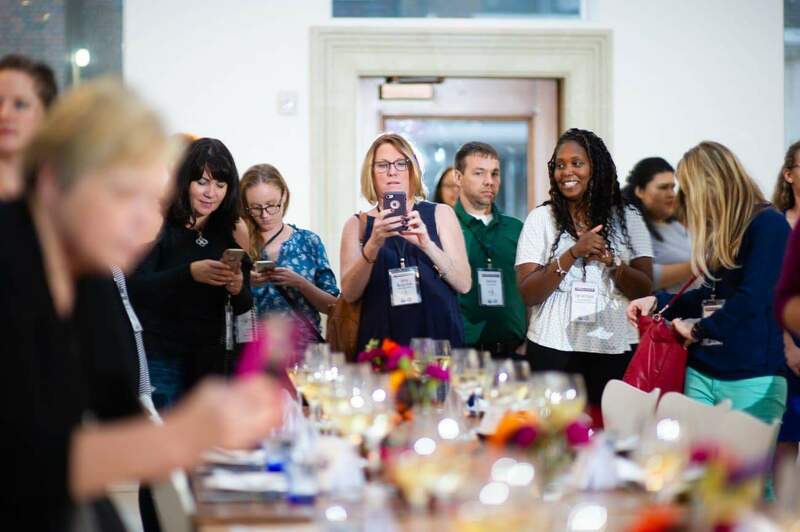 Such a great way to get to know the other bloggers and the fantastic folks who work for the North East Dairy Association. 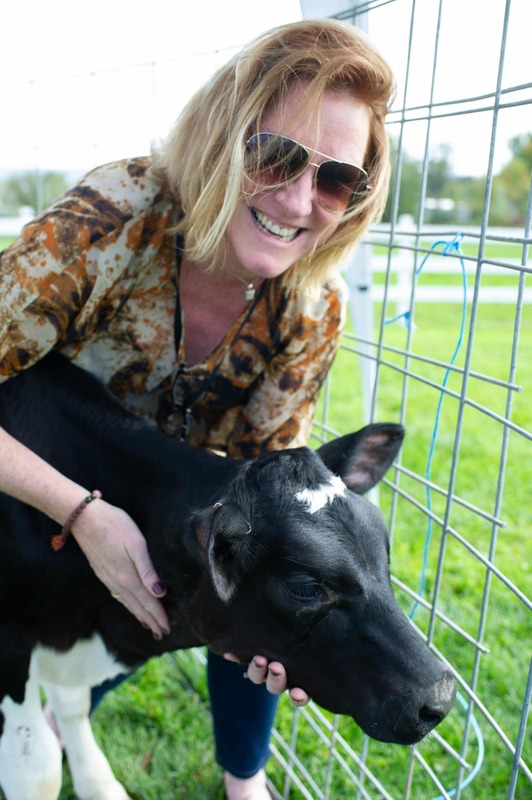 A great introduction to dairy farming. Look at the gorgeous centerpieces. Here I am hard at work taking pics for Social Media, a tough job but someone has to do it! 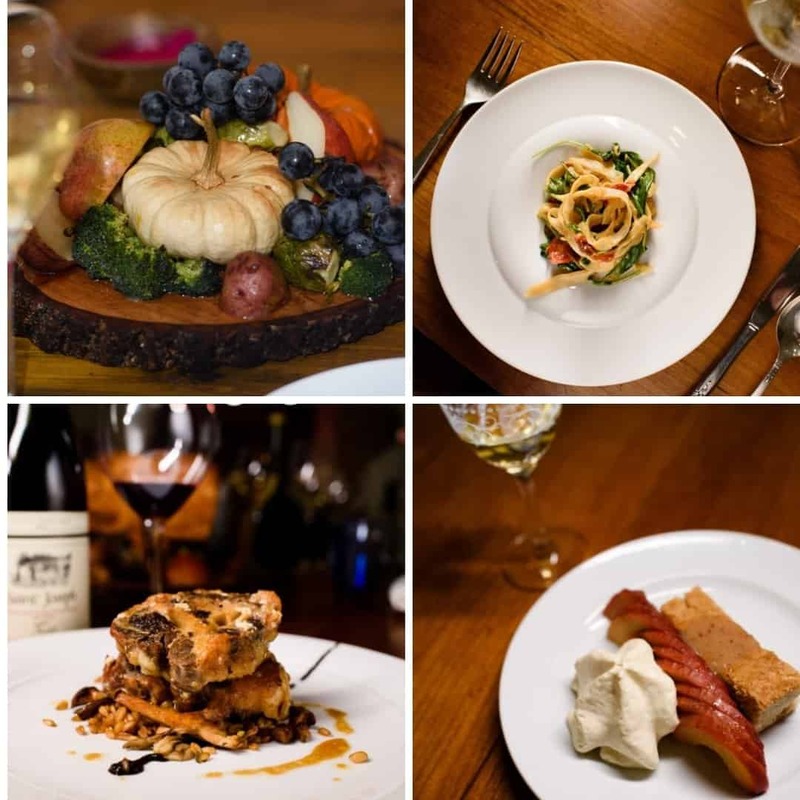 Our menu revolved around incorporating dairy into our courses and each course was absolutely amazing! Our crew spent the next day at dairy farms. One farm we visited was Ivy League Dairy. An amazing group of Cornell Graduates that run this farm together! They are a young group of dedicated farmers and it was a pleasure meeting them. Their passion for the land and their animals was incredible. The nutritionist for the animals test the cows feed to ensure they are receiving the proper nutrients. I could use a nutritionist! We saw lots of cows! They are so darn cute and I learned a lot about how they are cared for by the farmers. 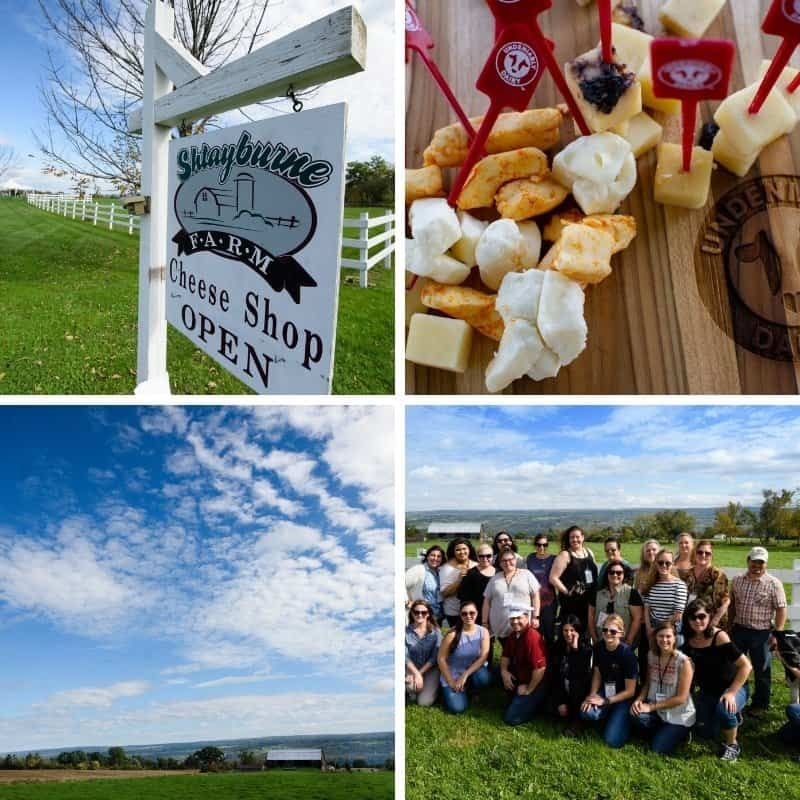 Part of our tour brought us to a lovely cheese farm Shtayburne Farms. A fantastic location where we had one on one time with a baby cow! Don’t let her fool you, I won her over in the end, in my mind anyway! Cheese curds are not easily found in my area and I am bummed! Those babies are addicting! They come in all sorts of great flavors like Buffalo, Cracked Pepper and Mushroom, and my personal weakness in life, Butter Garlic. Luckily, Shtayburne Farm takes online orders! Just look at the scenery, absolutely gorgeous! Look at those food bloggers, very happy after enjoying the most delicious cheese! I hope everyone gets the opportunity that we did to visit these farms. You will have a new perspective on the next delicious wedge of cheese you enjoy. 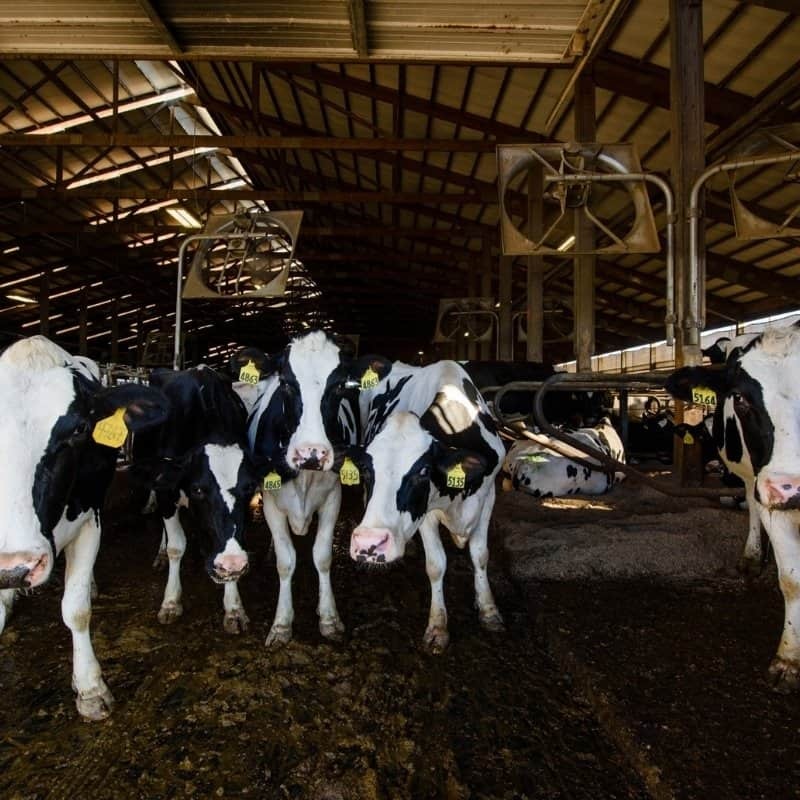 That cold, refreshing glass of milk with those Holiday cookies made with butter, I will give a nod of thanks to the Dairy Farmers for their dedication! 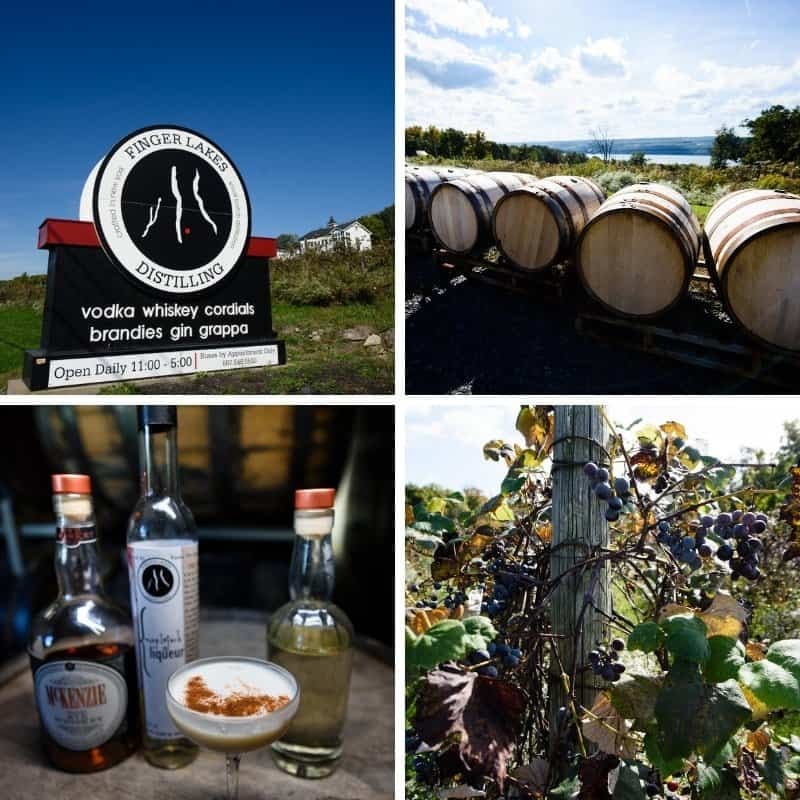 What a wonderful experience our group had at FingerLakes Distilling. 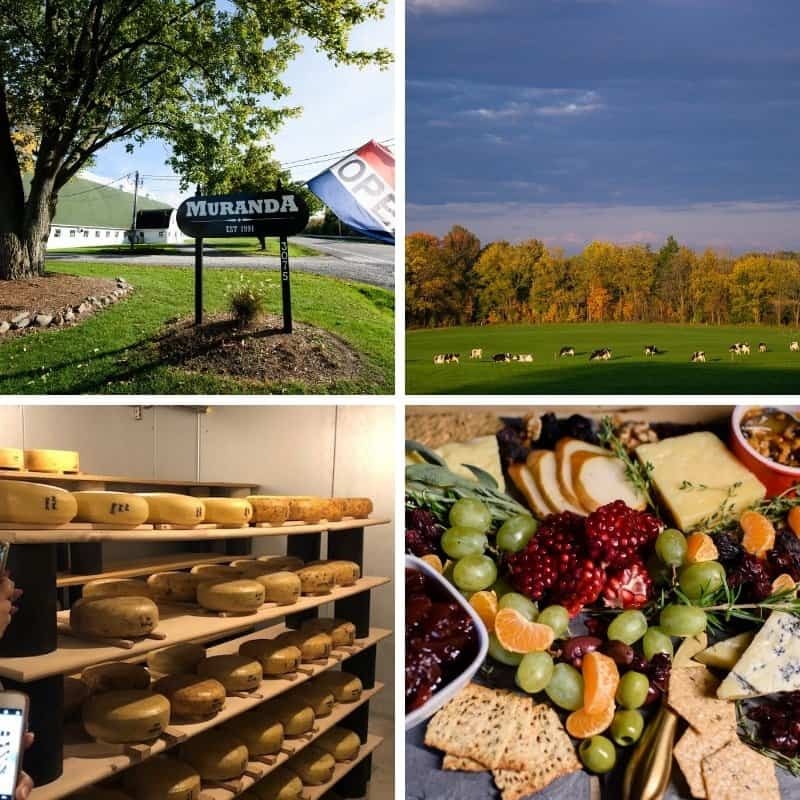 Another great location we visited was Muranda Cheese in Waterloo, New York! We got a peek into their amazing Cheese Cave! I could have stayed there a week! I love me some cheese! The owner Tom, was so knowledgeable! We sat on the deck of one of his beautiful buildings while Tom shared so much information with us! 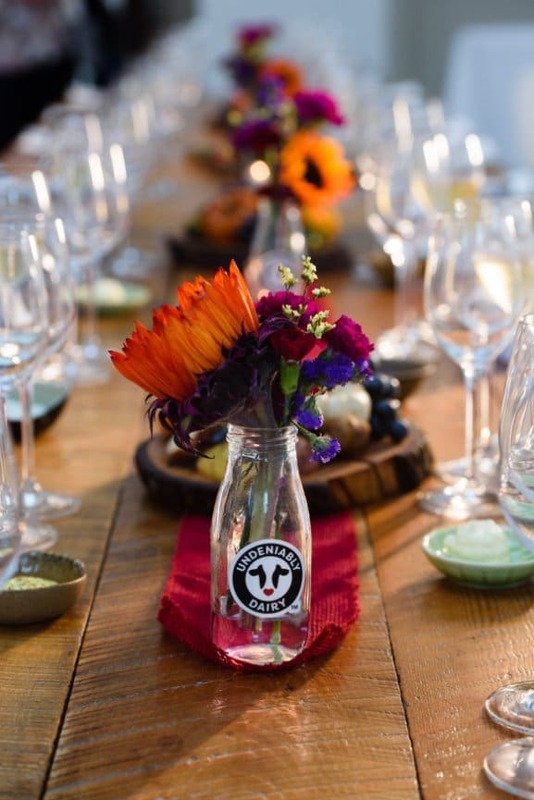 Milk is one of the first farm to table foods. High safety standards ensure freshness, high quality, and great taste! 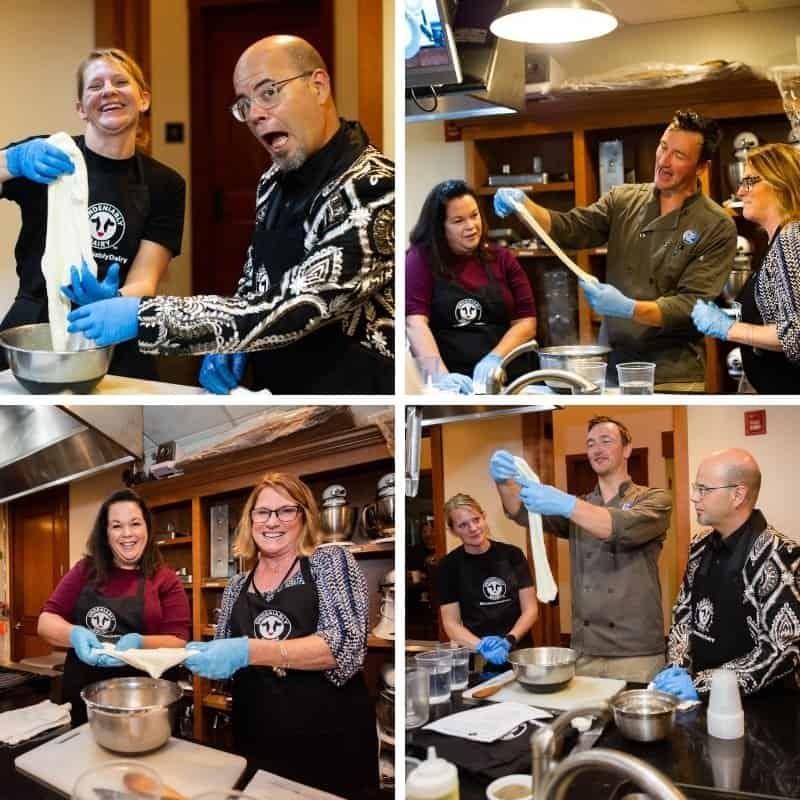 Mozzarella Making and Cooking Fun! What a great trip! On the last day, we learned how to make homemade fresh mozzarella. I had a blast and lots of laughs. Sort of therapeutic and very relaxing. The trip finished with a super fun food contest with all of us receiving an ingredient to showcase! It was so much fun. One of the judges was Jason Smith, From Food Network Stars. What a fun time with lots of laughs. My ingredient was milk-based cheese. I decided to make a family favorite, Three Cheese Spinach-Arugula Pesto Flatbread PIzza, okay, it is a mouthful, but so delicious! Better yet, super easy to put together. The base of the flatbread pizza is a spinach-arugula pesto. I am thinking of the farm to table experience, we grow our own spinach and arugula in our garden all summer. What better representation of the farm to table experiencence than veggies I grow! Then there is crumbled chicken sausage to add protein and a little extra deliciousness! The cheese in this flatbread pizza recipe is New York Cheddar, Smoked Gouda, and Colby Jack! The flatbread is easy to prepare and bakes in just a few minutes. Cheese, well that is what my recipe was all about and these are three of my favorite types of cheese. What if I want a crispy flatbread? I like the flatbread a bit crispy. In an oven warmed to 400. degrees, brush the flatbread with some olive oil and place right on the oven rack for about 3 minutes. Please read the labels of you need a gluten-free flatbread. Flatbread is not normally gluten-free. Can this recipe for Cheesy Flatbread Pizza be made on a grill? Absolutely. Heat the BBQ to 425 degrees and place the flatbread on the grill over medium heat for about 4-5 minutes. Enjoy! Flatbread originates in India where it is made with whole wheat flour. Can I change the cheese on this flatbread pizza? Of course, as I always say, recipes are the guide, feel free to change the cheeses to what you have on hand. About the Spinach-Arugula Pesto, you do not use nuts, why? Just like my skinny basil pesto, I choose not to add nuts to most of my pestos. It lowers the calories and many of my relatives have a nut allergy. Brush the flatbreads lightly with olive oil. Place the flatbreads in a heated oven for about 2 minutes, to crisp up the flatbread. Take out and set the flatbread aside. In a saucepan, heat a little olive oil and saute chicken sausage crumbles and shallot until sausage cooked through. Set aside. In a food processor, puree spinach, arugula, garlic, Parmesan cheese, salt, and pepper. Spread the spinach-arugula pesto onto the flatbread. Add the chicken sausage/shallot combo. Top with shredded New York State Cheddar, Smoked Gouda, and Colby Jack. Bake on a pizza pan or baking sheet about 10 minutes. Serve and enjoy! I love any comments or questions! Please feel free to leave them below! Like this recipe, please give it a 5-star rating and comment below is always helpful for me and other readers. 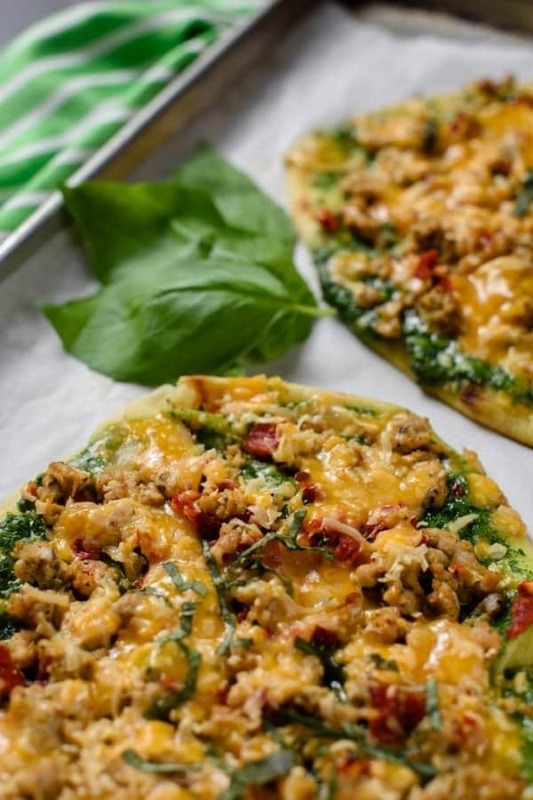 A delicious and easy flatbread pizza with an amazing spinach-arugula pesto topped with chicken sausage! A family favorite and so easy to assemble and bakes in minutes. In a food processor, combine spinach, arugula, olive oil, Parmesan Reggiano cheese, lemon juice, garlic, black pepper, and salt. Pulse to combine all ingredients. Check the seasoning. Reseason if needed. Set aside. Preheat oven to 425 degrees for the flatbread pizzas. In a medium skillet, over medium heat, spray non-stick cooking spray. Add the chicken sausage and chopped shallots. Saute for about 5 minutes and add in sun-dried tomatoes. Continue sauteeing until chicken sausage is golden brown, about 10 minutes. Set aside. 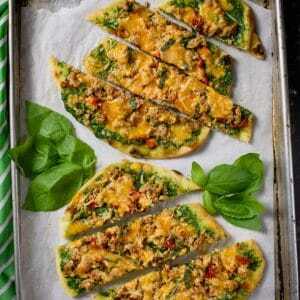 Place the flatbreads on a baking tray. Spread Spinach-Arugula Pesto on the flatbreads. Sprinkle the crumbled chicken sausage over the pesto. Top with the three different types of cheese. Then sprinkle the Italian Seasoning. Put the Flatbread Pizzas in the oven on the center rack. Bake for about 10-15 minutes, until cheese is melted. Serve and enjoy. Note 1: Tightly pack the measuring cup with the spinach and to measure out two cups. Also, wash and dry spinach and arugula. Note 2: I use wholegrain flatbreads. For my girls, I use gluten-free flatbread. Note 3: This makes more than enough Spinach-Arugula Pesto for the pizza. I freeze the excess pesto in ice cube trays and use in pasta, zoodles, and soups. Note 4: I like my Flatbread crispy so I prefer to heat them in the oven for a few minutes. This is optional. Note 5: This is an approximation. The Spinach-Arugula Pesto is more than you need for the flatbreads. any nutritional data I provide is an approximation and actual dietary information can vary based on ingredients and proportion sizes. For this recipe, it was quite difficult to calculate the estimated nutritional values because there should be left over pesto. I always make extra pesto to freeze and use later.